Facebook Messenger – Connect with friends and followers through the Facebook Messenger. This app doesn’t require anything but a name in order to contact a friend. 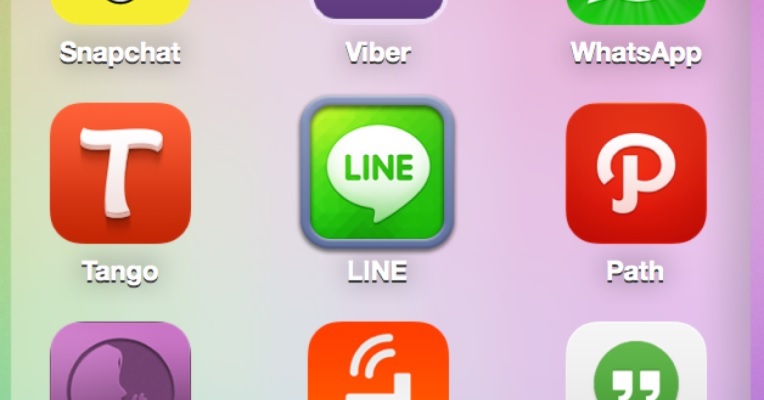 LINE – LINE is a business based messenger that allows businesses to chat and communicate with their clients for free. Think Skype but more specialised. Viber – Viber is a messenger that is as fast & easy as texting. This messenger uses your phone’s internet connection (whether Wi-Fi or your data plan) to let you send text messages, share photos & videos, add stickers, or make voice calls and video chats. WeChat – WeChat is a messaging and calling app that allows you to easily connect with family & friends across countries. It’s the all-in-one communications app for text (SMS/MMS), voice and video calls, Moments, photo sharing, and games. Snapchat – SnapChat seems to be the trend right now so why not add it to the list. With SnapChat you can take a photo or a video, then add a caption or doodle or lens graphic to it, and send it to a friend. Alternatively, you can add it to your “story”, a 24-hour collection of your photos and videos, which you broadcast to the world or just your followers. Telegram – Telegram is a messaging app with a focus on speed and security. It’s super-fast, simple, secure and free. You can send an unlimited amount of messages, photos, videos and files of any type (.doc, .zip, .pdf, etc.). Telegram groups have up to 5000 people and you can create channels to broadcast messages to an unlimited number of subscribers. A new breed of dataless, wifiless messaging app has been born and it’s a pretty awesome idea. The technology for mesh networks has been around for a long time but it’s only in recent years that we have started seeing it used for chat messengers. The basic idea is to create a closed network of devices which are connected via wifi or Bluetooth. This application doesn’t use data though as it uses your wifi connection to jump from one device to the next rather than connecting to a data service first. In other words, your devices are talking directly to one another. FireChat – FireChat works even without an Internet connection or cellular phone coverage. Use it anywhere: planes, public transportation, cruise ships, campuses, and crowded events. All you need is a few people around you using FireChat. Bluetooth and WiFi need to be “on” to send and receive messages when not connected to a network. And if you are connected to a cellular network or WiFi access point, then FireChat will work too. You will be automatically connected directly with one another, creating your own network for public and private communications. The more people use it, the bigger and faster your network becomes. The Serval Mesh – Serval Mesh works by using your phone’s Wi-Fi & Bluetooth to communicate with other phones in your vicinity. Or even by forming impromptu networks consisting only of mobile phones. Mesh communications is an appropriate technology for complementing cellular networks. Think of it like two-way radio or CB radio that has been propelled into the 21st century. For long-range communications you will still need to make use of cellular or fixed telephone networks or the internet. Wi-Fi Talkie – With Wi-Fi Talkie you can organize communication between devices at distances of Wi-Fi signal without using an Internet connection or a cellular network. This new technology is still in its early stages but given a few years, who knows where we could end up? For now, it means that we have access to help in emergencies and we can finally communicate with one another for no fees, the way it should be.